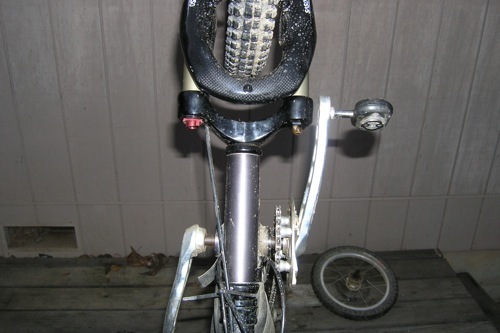 The original fork on my 2000 bikeE FX was starting to show some wear, and since I use the bike exclusively on the trail I was interested in trying out a 20" front wheel which might handle the rocks, roots, and ruts better. Getting it together was a lot more work than I expected, but it works and definitely handles the trail better. The right crank also needed to be bent, but not as much. Buy a 20" fork. Since this is a mountain bike, I wanted a suspension fork with more travel than the original bikeE fork. I found this at HostelShoppe, and it looked like what I needed. Alas the crown was wide enough to interfere with the pedals, and had to do mods listed below. Interestingly, this fork is lighter than the original 16" one from bikeE! Since there doesn't seem to be any recumbent forks in 1-1/4", you have to buy shims to make a 1-1/8" threadless headset fit in a 1-1/4" head tube on the bike. (I've read that Chris King makes a 1 1-8" headset that fits in a 1 1-4" head tube, but it's pricey.) You can buy head-tube shims here. Get a new 1-1/8" headset. Mike at Easy Street Recumbents can set you up with shims and spacers to help your existing 1-1/4" riser clamp on the new 1-1/8" steerer tube. 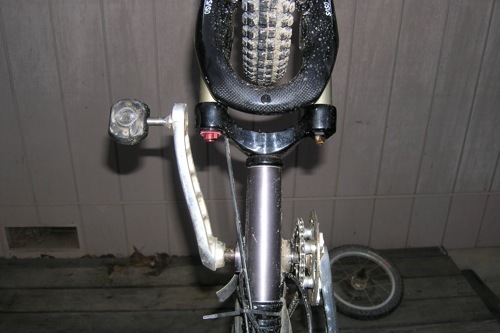 But wait - the pedals interfere with the fork crown! Yikes. I tried getting the widest bottom bracket I could find (136mm - thanks Mike), but even that wasn't enough. So with much trepidation, I went to my nextdoor neighbor who has every tool under the sun. I carefully put the cranks inside a huge, well-anchored vice (with wood on either side), took a 2' long pipe wrench, and *very* carefully added more of an S-bend to make the cranks clear the fork crown. I imagine that it would be really easy to crack the cranks, so do this at your own risk. But I did get a satisfactory bend. One note - with the wider bottom braket you'll want some chainring spacers and longer bolts to move the front chainring closer to the frame and keep the chainline straighter. Of course, you'll need a 20" wheel for the front. 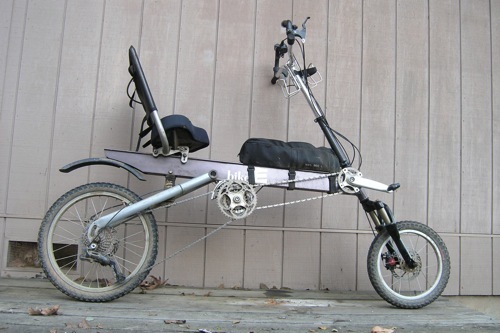 A good source for rims, spokes, or custom-built small wheels is Jay Gaerlan (who normally sells folding bikes, but has all sorts of small-wheel stuff). In this case I had him build a disk-ready front wheel for me, and he made a beautiful one. Fork flop. When the bike is stopped, the handlebars really want to go either right or left. It's not really noticable to me when moving, however. Lighter front end. Lifting the front end by 4+ inches makes the front end lighter on the steepest uphills, making me lean forward sooner to keep the front wheel from lifting. I wouldn't want to make this change if I didn't have an XL length frame, or if I was any taller. Lowering the handlebars by a few inches helped this a lot - for mountain bike riding you want a more upright posture anyway. Having 2.5" of travel on the front fork is great! 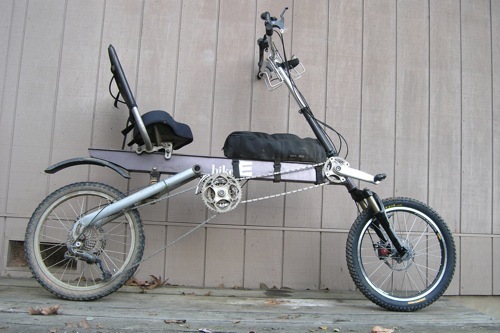 That, plus the larger front wheel, make this bike handle all the bumps on the trail much better. Going down hill at speed the bike feels much more stable than with the 16" front wheel. So, I'm happy with the change, but my needs are pretty specialized. I think the 20" front wheel is probably a reasonable change, especially for anybody already used to how a bikeE handles. But I don't recommend a wide-crowned suspension fork like this unless you're ready to face the risks of bending the cranks by yourself.